We meet at a time of continued and severe civilian suffering from the effects of weapons in conflict. And we meet in an international context where the value and importance of rules and norms seems to be increasingly under threat. Yet multilateral disarmament bodies like this one are founded upon a collective belief that there are limits to how we should be allowed to kill and injure each other. And that those limits can be progressively developed and collectively maintained – through rules, and through shared expectations of behaviour. It is encouraging, in this context, that the CCW is considering both emerging issues relating to new developments in science and technology and also issues that cause civilian suffering now. 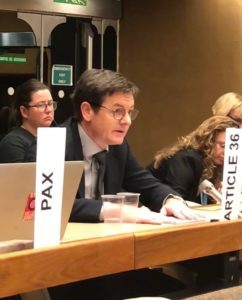 As a founding member of the Campaign to Stop Killer Robots, Article 36 is encouraged by the growing support among states and other actors for a legally binding instrument that would ensure the retention of meaningful human control over attacks in armed conflict. We appreciated the constructive mode of work in the 2018 Group of Governmental Experts, butweregret that Group was not more ambitious in terms of the political way forward. We urge High Contracting Parties to confirm a mandate for the 2019 GGE that allows for a focused discussion on the characteristics of the necessary human control, coupled with concrete proposals for a legal response. Beyond autonomy in weapon systems, other innovations in science and technologymay also have implications for weapons control and disarmament. We are pleased that the High Contracting Parties have set aside time to discuss how relevant developments in science and technology may be addressed under the Convention. Our research into the weaponization of nanotechnologies, directed energy, and acoustic phenomena suggests that scrutiny of such developments, even at a general level, is important; not least to foster a shared understanding among High Contracting Parties of what developments are relevant to the Convention, and how, if at all, they may affect the achievement of its object and purpose. But whilst emerging issues present new challenges, civilian harm in conflict is still being driven by issues of established concern. Here we believe states should continue to strengthen broad normative movements that favour civilian protection. The horrific Napalm bombings of the 1960s and 70s, are thankfully, no longer common practice. And the CCW has no doubt contributed to that. Nevertheless,weapons with incendiary effectscontinue to be used, with severe consequences. We call on High Contracting Parties to work constructively to strengthen Protocol III – to strengthen its rules, and to strengthen the stigma associated with incendiary weapons. Area bombardment of towns and cities, as it was practiced up until the 1960s, is also no longer deemed acceptable today. Yet still, the use of explosive weapons in populated areas is a major cause of immediate and long-term harm. There is growing recognition that using explosive weaponsthat affect a wide area in cities, towns and villages exposes civilians to an unacceptable risk. We were encouraged to see fifty states supporting a statement at First Committee last month in which they committed to political action on this issue. Whilst we will follow closely discussions on explosive weapons in populated areas in this forum, we believe that States determined to address this issue should develop a political instrument, that commits them to operational policies and procedures that aim to avoid the use, in populated areas, of explosive weapons that would have wide area effects. The UN Secretary-General’s agenda for disarmament is a timely reminder that, as well as tackling specific issues, disarmament can also function as a conversation that fosters a more peaceful, just and secure world, sustained by effective governance mechanisms, based on the rule of law. The CCW has an important role to play in creating that world, if the High Contracting Parties work together with determination.